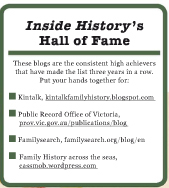 The topic for Week 22 in Amy Coffin’s and Geneablogger’s 52 Weeks of Personal Genealogy and History series is Secrets. Describe something about yourself that won’t be found on any record 100 years from now. Well my first thought was that if it was a secret it wouldn’t be so any longer once I blogged about it! So what will future descendants of mine miss about my life if they rely on the records? In 100 years it will be all too easy for my great-great-granddaughter to wonder where I got to for about 8 years in the 1970s. They will find my marriage and the birth of two of my daughters in Queensland and possibly assume that I had continued to live in Queensland all my life. The Australian-based records, assuming they’re all digitized and indexed by then will let them trace me and my “migrations” and events. 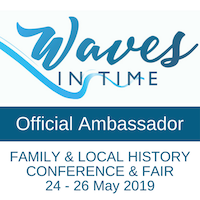 They will even, with a bit of luck, reveal some details of my working life and hobby (sorry, obsession) of family history. But they will have missed a very formative part of my adult life. An attentive and thorough researcher who buys the certificates may get a clue that I left the country for a few years and that my husband’s then place of residence, Territory of Papua New Guinea (TPNG), may provide the clues they need. 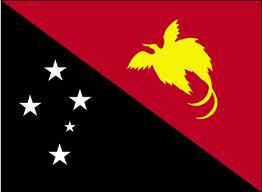 However it’s quite likely this will still not disclose much about my life there because unless things change, records in Papua New Guinea are very difficult to come by. However if that does change, they may get lucky and may find our little “Gehuka”, born in the PNG Highlands, from the official records and may even find her baptism records. They may even get very lucky and find our employment records and so be able to trace our movements around the country, and my in-laws before us. However they will have no real sense of the amazing sights that we lived with: the magnificent scenery, the power of a football-field filled with tribal warriors in full traditional attire and armed with spears and other weapons, the singing and drums, the hazardous flying conditions, the isolated villages or a small band of warriors armed with spears intent on “payback”. The timeline of our life there will clue them in that we lived through self-government (1973) and Independence (1975) as the former Australian Territory became an independent country. Official documentation will not tell them that we were anxious going into self-government given the bloodshed and riots that had accompanied so many African nations recently gaining their autonomy. 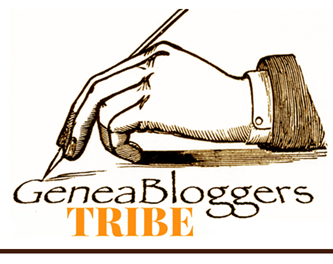 Our descendants won’t know that at self-government we lived opposite the Goroka hospital and listened to much noise, bottle-crashing and rubbish-bin-lid-banging that night but that we were at no risk. 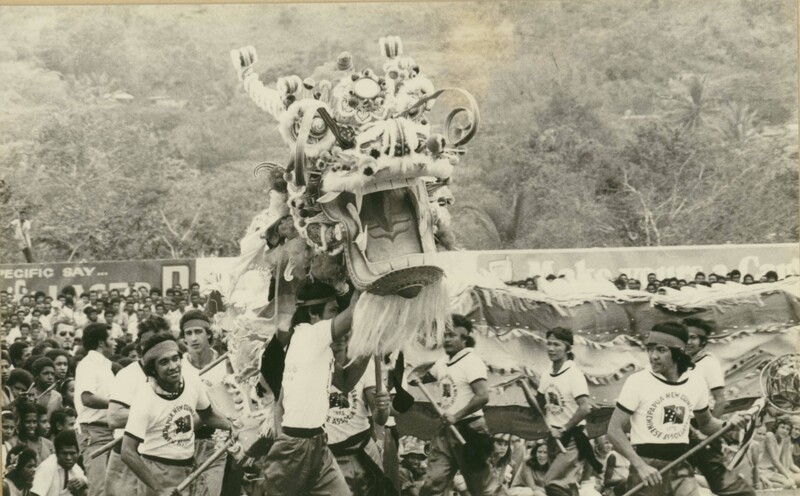 By the time Independence came around we were living in Port Moresby and were able to participate in the many celebrations. The stores were decorated with red, black and gold streamers and the official banners were black birds of paradise on contrasting fabric, one of which we still treasure. We went to the Catholic Cathedral and saw Prince Charles (much younger then, like the rest of us!) 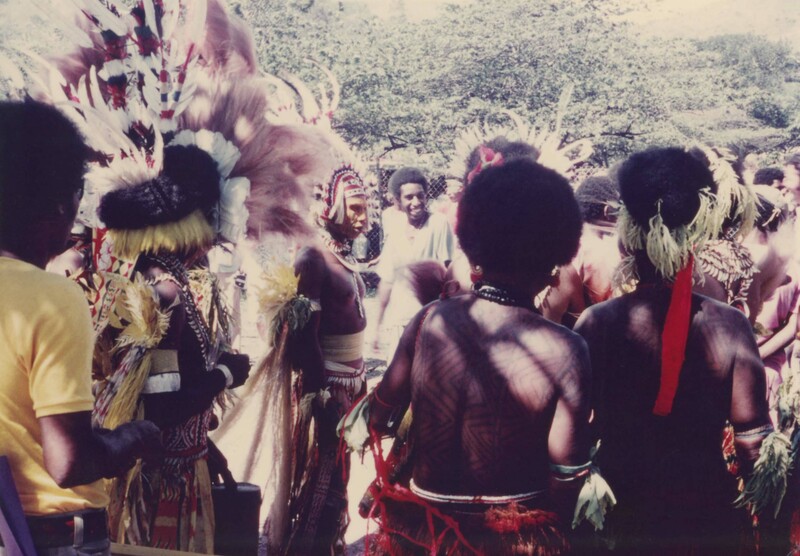 arrive to be greeted by the Bishop, Australian Prime Minister Gough Whitlam, other dignitaries, and school children in traditional sing-sing attire. In a short report I wrote at the time for my family in Australia, I mentioned that Mr Cassmob had heard murmurs of dislike for Whitlam when he arrived while Andrew Peacock, formerly Foreign Minister was well received. Michael Somare, the first Prime Minister, drew a spontaneous burst of applause. There were other ceremonies to celebrate Independence and we were at Hubert Murray Stadium (in the grandstand and “on the hill”) and saw the amazing diversity of local dress, colour, and dance, with the Manus Islanders inevitably dominating the rhythm. The Australian Navy was nowhere near as precision-drilled as the PNG Defence Force (PNGDF) which had nary a step out of place. Prince Charles arrived in stately fashion in the British Embassy Daimler flanked by traditionally-dressed dancers. Our eldest daughter then only a youngster and visiting the ceremony with her crèche/child-care called him “the man in white who was going to be king”. Prince Charles did the requisite inspection of the troops to the Skye Boat Song, some even forgetting their training long enough to take photos, and then did the rounds in an open-backed jeep. 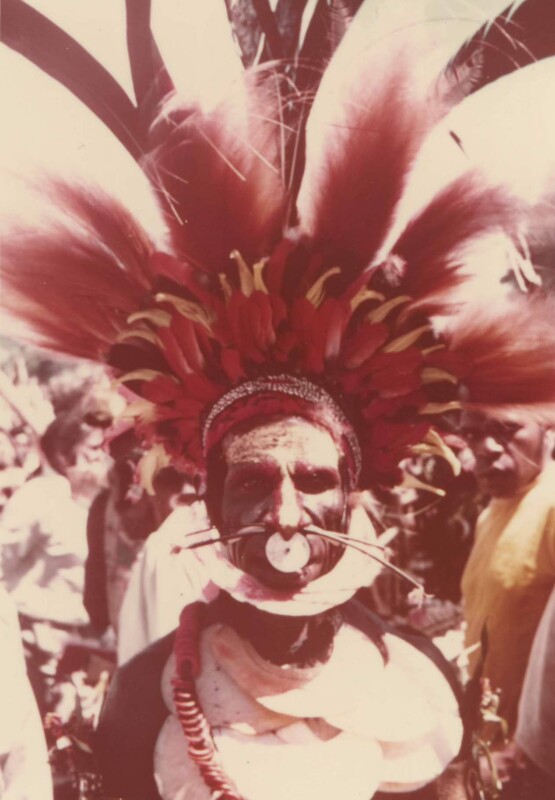 The colour and diversity of the local people and their traditions were among the wonderful features of PNG. We were also very moved at the lowering of the (Australian) flag ceremony to the traditional bugler’s lament, “day is done”, and an impressive gun salute by the armed forces. We were proud to be part of such an important part of the country’s life and to have contributed in some way to its development. The new Governor General, Sir John Guise (aka Doctor John) from my husband’s “home” province of Milne Bay gave a well-toned speech about lowering the flag not tearing it down. A tinge of sadness was covered by pride and enthusiasm for the new country, especially when they paraded the flag to Auld Lang Syne, accompanied by the bagpipes. The PNG nationals were looking equally solemn during this moving ceremony. 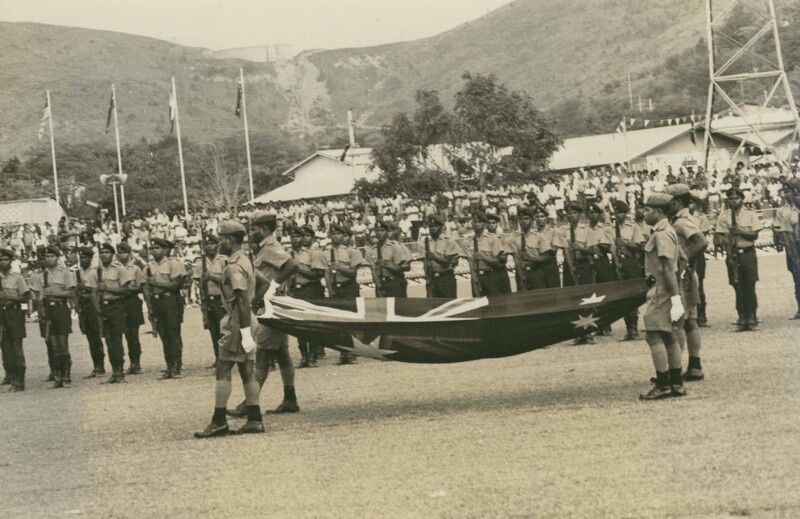 Parading the Australian flag at Independence. 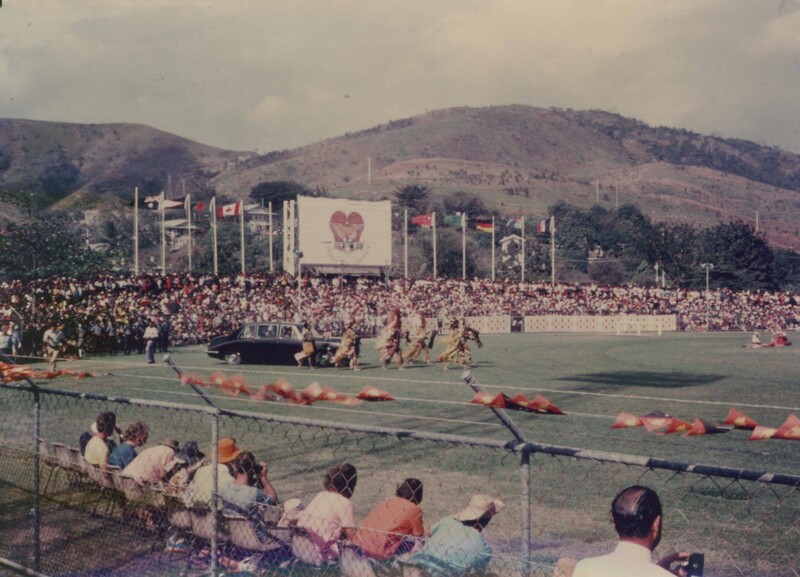 On Independence Day, 16 September 1975, our family went to Independence Hill and watched as the young high school students in their multi-coloured “uniforms” formed an honour guard and the new national flag was raised with much jubilation accompanied by a fly-over of military aircraft. While our family was part of the huge crowd photographed that day and appearing in the local Post Courier newspaper, there is no way our great-great-granddaughter could pick us out –unless she knew of my “signature” habit of wearing my sunglasses on my head, though even then I’m obscured by my blonde sunnies-wearing friend. So much of this secret would have been lost had we not written some notes soon after these amazing events – our memories recall only the highlights, not the level of detail that the notes have once again revealed. 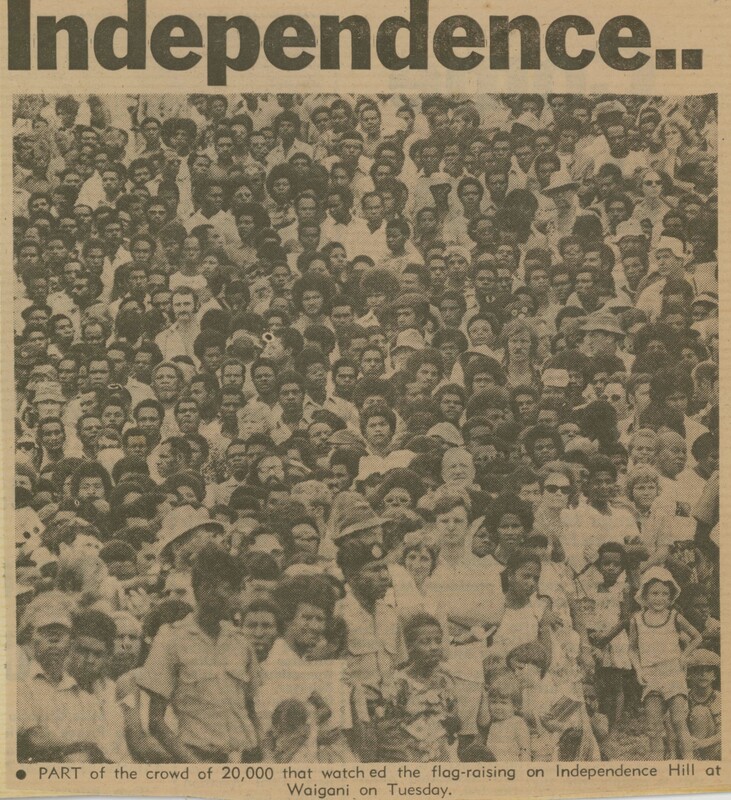 Part of the crowd at Independence Hill on 16 September 1975. Most of our photos are on slides and Super 8 films and really need to be scanned and the films converted…more jobs.